Have ye offered unto me sacrifices and offerings in the wilderness forty years, O house of Israel? 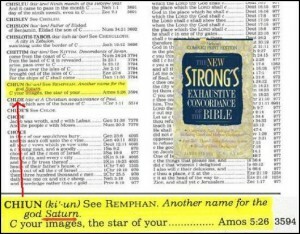 But ye have borne the tabernacle of your Moloch and CHIUN (SATURN) your images, the STAR of your god, which ye made to yourselves. Therefore will I cause you to go into captivity beyond Damascus, saith the Lord, whose name is The God of hosts. “Remphan, Acts 7:43, and CHIUN, Amos 5:26, have been supposed to be names of an idol worship secretly by the Israelites in the wilderness. Much difficulty has been occasioned by this corresponding occurrence of two names so wholly different in sound. The most reasonable opinion seems to be that CHIUN was a Hebrew or Semitic name and Remphan and Egyptian equivalent substituted by the LXX. 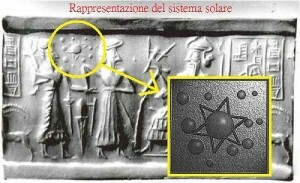 This idol corresponded probably to SATURN or Molech. Everyone needs to wake up and come out of Babylon. Both Christians and Jews have been deceived about their religion.The “Star of David” has nothing to do with King David and everything to do with the Babylon Mystery Religion.